20,000,000 Miles to Earth - Rocket returning from Venus unleashes nasty creature that doubles in size every night. Ray Harryhausen, celebrated stop-motion artist, does the effects. The Lost World (1925) - Willis O'Brien's (the stop-motion pioneer) work in an early feature based on the Doyle novel. King Kong - Willis O'Brien's best movie. The classic monster movie against which all others were measured. Mysterious Island - From the Jules Verne book. Stop motion by Ray Harryhausen. Giant insects, crabs, etc. menace visitors. Journey to the Beginning of Time - Boys find a lost world populated with dinosaurs, mammoths, etc. The Lost World (1960) - Update of Doyle's novel. Expedition finds dinosaurs and stone age men in South America. They use real lizards, blown up, for the dinosaurs. A somewhat effective, but lazy, technique. King Dinosaur - Not very good. Live, enlarged, lizards. The Giant Behemoth - British Production. Oversized sauropod destroys London. It's emits radioactivity like an electric eel, so it causes things like helicopters to blow up when they get near enough. Go figure. The Giant Gila Monster - Overgrown lizard terrorizes countryside in the SouthWest. Live lizard. Publicity describes it as "eating people as if they were flies." Loch Ness Horror - This movie ignores the fact that there has never been a report of anybody being injured by the Loch Ness Monster (if it exists). They used a giant puppet for the plesiosuar type monster. Ghidrah! The Three Headed Monster - "Created by a giant atomic fireball hurled from outer space." Man in suit. 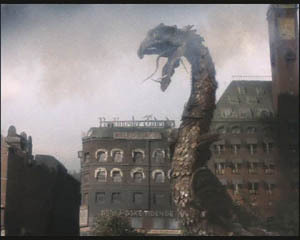 He goes at it with Godzilla and Rodan (right). The Land That Time Forgot - From the Edgar Rice Burroughs' book. Submarine penetrates icecap to find lost world populated by dinosaurs and primitive man. It Came from Beneath the Sea - Oversized octopus eats San Fransico. Good stop motion. A Harryhausen effort. Carnosaur - Mad scientist plans to kill off the human race to make world safe for dinosaurs. Them - Radiation mutates insects to giant size and they try to eat mankind. Valley of the Dragons - People get blasted "off the face of the Earth into the Valley of the Dragons." Live, enlarged, lizards. Godzilla, King of the Monsters, Godzilla vs. the Thing, Godzilla vs. King Kong, etc. - All are Japanese in origin. Giant, in fact ridiculously giant, reptile and friends, terrorize Japan. You can tell it's just a man in a rubber suit, but the beautifully detailed sets of the miniature cityscape he destroys make it worth taking a look at least at one of these. The Giant Claw - A creature that looks like a vulture that's "larger than a battleship" attacks New York City. It is particularly fond of grabbing planes flying in mid-air. Tarantula - Irradiated spider walks out of a laboratory to grow larger than an office building. Uses live, enlarged, tarantula to get the effect. The Beast from 20,000 Fathoms - Dinosaur is freed from ice during atomic test and swims south to visit Coney Island without a ticket (right). Probably one of the best stop motion pictures of its era thanks to Ray Harryhausen. Journey to the Center of the Earth - From the Jules Verne book. Features live lizards with fins glued to their backs as Dimetrodons and a giant chameleon with "a 20-foot tongue." They look pretty good, though. The Crater Lake Monster - Plesiosaur terrorizes lake visitors. Stop motion photography. Rodan - Supersonic flying creature attacks Japan. A lot like Godzilla, but in the air. Reptilicus - This film is the only monster movie ever made in Denmark. Basically it is a bad puppet that spits green slime in Europe. The Land Unknown - Helicopter crashes in lost world. The man in the T-Rex costume looks incredibly fake. At Earth's Core - From the Edgar Rice Burroughs' novel. Assorted strange creatures threaten explorers. Men in costume. The Valley of Gwangi - Cowboys and prehistoric reptiles. It's not easy to lasso a T-Rex. Good Harryhausen stop-motion. Beast of Hollow Mountain - More cowboys and dinosaurs. Gorgo - Baby sea monster is captured and taken to London for exhibition. Mommy is not pleased. Man in suit. Son of Kong - His offspring is a good guy. Well, a good ape. Stop motion. One Million Years B.C. - Somehow primitive man, ice age mammals and dinosaurs wind up together in this flick (right). Rachel Welch looks great in her animal skin bikini, though. Mixes stop-motion with live lizards. When Dinosaurs Ruled the Earth - Primitive people and dinosaurs together again in this picture. Blond girl to be sacrificed to a T-Rex runs away and trains a baby dinosaur as a pet. Stop-motion effects. Baby - Explorers find baby sauropod in Africa. When a bad-guy scientist tries to take her away the mother attacks. Stop-motion effects and mechanical, full-sized puppets. Jurassic Park I, II and III- First extensive use of computer graphics to create realistic animals in films. Effects are incredible, but story is a bit weak. The Black Scorpion - Willis O' Brian effects, Giant scorpion from prehistoric times attack New Mexico after being unleashed from a vast underground cave by volcanic action. In addition to the giant scorpions, a large cave spider and giant, armor plated worm are also featured in this 1959 feature. The Deadly Mantis- A 1957 film about a prehistoric mantis that heads for New York after being released from an iceberg. Realistic puppetry bring to life an insect big enough to battle Godzilla. The Killer Shrews - Made by the same people who gave us The Giant Gila Monster (producer was Ken Curtis, Festus on the long-running Gunsmoke series). Interesting story about scientifically altered shrews realized by a pack of dogs with long fur glued to their skins and a full size puppet of the head section. The new breed of shrew, when fed poison, adapts to the toxin and develop poisonous drool. Man Beast - One of many films about an expedition into the snowy Himalayas to find a breed of giant man-like apes. This one from the mid-fifties, introduces the idea of human-yeti mating. Copyright Lee Krystek 1996-2001. All Rights Reserved.